We’ve had some great turnouts for our #ds106radio tweet-alongs this week, and some great insights as well. 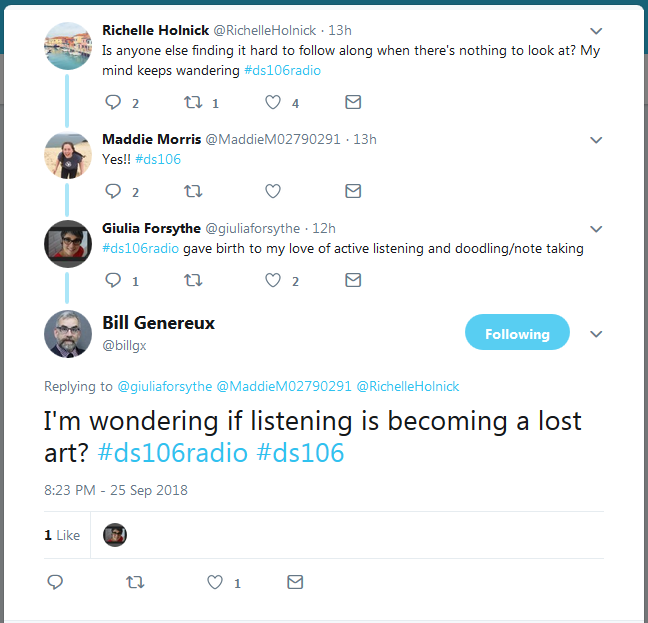 Is listening a lost art? In the days before television, back in my parents’ and grandparents’ days, listening to radio shows was a family activity. And the point of listening was to listen. Now, listen to audio is more of an individual activity, and it’s often done as a secondary activity – listening while driving/walking/running, or doing something else. So maybe we’re not practiced at focusing, or maybe we are practiced at giving our ears limited attention. Part of it is also the idea of critical attention. When we take photographs or look at photographs, as many people pointed out last week, we think about the content of the images. We typically don’t stop to consider the formal aspects and principles of photography. It’s the same with reading, or watching video – we look for the story, and generally don’t stop to think about how it’s being told. But that’s exactly what we’re trying to do in this class. We looked at video stills last week for examples of principles of photography. We should think about how things like contrast or balance in an image contribute to the story. How do they create or affect meaning? A few people commented on the vocal characterizations in the Anansi Boys broadcast. In some ways, they made conversations a little difficult to understand. They also placed the majority of the story in the UK. I think the variety of voices creates a kind of texture that draws our interest. Inasmuch as listening is hard, the texture makes it easier. But I think that variety also does something for the meaning of the story. We hear Caribbean accents, British accents, and an American accent – and they’re all in the same family. Anansi is a storyteller, and his stories are not confined to one place, but run throughout humanity. I think that’s part of what is being told through the variety of voices. But the main thing we’re looking for, or rather listening for in these broadcasts, is how sound is used to convey information and meaning. We can hear not only what is being said, but what is going on and where it is happening. If we pay attention and think about it, we can hear how sounds are accomplishing that. There was a neat trick that they did a few times during the broadcast, where you could hear the perspective of a scene switch from one end of a phone call to the other. You hear one voice present, with you, and the other as if it is coming through a phone. And that’s something we could do ourselves, using Audacity and looking for a little how-to. We can add a little background sound and make a scene at night (crickets) or morning (birds chirping). Little clues that convey a lot of meaning. When we engage in that kind of analysis, we uncover the language of the medium, and we can see how to use it for our own purposes. This entry was posted in Uncategorized and tagged ds106, ds106radio. Bookmark the permalink.